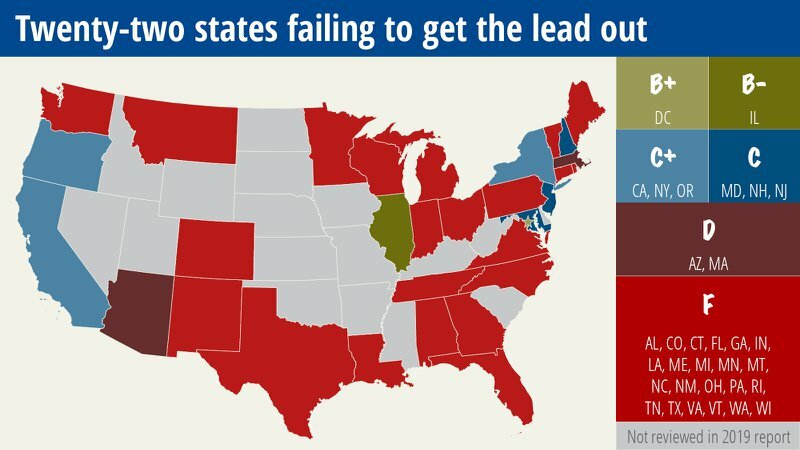 THESE States got an "F" for their efforts to remove lead from school drinking water. The report released by the advocate groups Environment American Research & Policy Center and the U.S. PIRG Education Fund assigned 22 states an “F” for their efforts to remove lead from school drinking water. The report was created to provide grades on the effectiveness of laws to require schools to proactively remove lead from school water systems. The national report follows a recent analysis of new data that found 97% of schools that participated in a voluntary testing program in Washington had at least one drinking water source with lead levels above 1 ppb. This is the standard set by the American Academy of Pediatrics. But.. the report used even tighter standards for lead in school drinking water of 10 ppb and tests drinking water at schools once every three years. ..Which means that the states listed are giving kids water that is ten times the recommended safe limit. Does this report mean that only schools have this problem? Of course not! The elad is IN the water and the water is reticulated throughout the community, meaning, simply, that if you are in one of the 22 states mentioned, you are getting poisonous water. Read the full report and see the grades assigned to each state in the study here. And to make it easy, see the pic above. Is there something you can do today? Indeed there is. You need a water filter and you need to send the healthy, filtered water with your kids to school. Don't wait for the school water to be fixed. Lead has its most pernicious health effect on kids. This water filter will remove lead.. plus the other contaminants you've heard about recently, like PFAS, fluoride, chloramines, heavy metals and much more. Not only that, it alkalizes your water and supercharges it with health-giving molecular hydrogen! It costs more than a big box store water filter but it's been lab tested for the life of the filter so you can rest easy, knowing it will keep on working, producing water like a mountain spring every day! PS: Wherever you are, we deliver. From Azerbaijan to Alaska, Australia to Zanzibar.